December is here and it's got me all excited! Mainly because December is my Birthday Month. Yes, I'll be 23 on the 23rd of December. Omg I'm going to miss 22!! twenty-two was definitely a magical year for many reasons, but I'm looking forward to many more magical years! Fun fact, my blog was actually named after my age- if you didn't figure that out already lol. I can't count the number of times someone has asked me, so will your blog become 'twenty-three crowns' when you turn a year older lol!. My response the first time I got asked that was, 'I should have really thought of that lol' It never actually occurred to me. But yeah, we'll stick with twenty-two, it's still a very special year. Well, first term has officially come to an end! Oxford has three terms: the first term, which is called Michaelmas Term; the second term which is called Hillary Term and the third term- Trinity term! Hopefully that didn't sound like French lol but Michaelmas is over. While it was a term filled with endless readings, which was quite stressful at times, there were also some very exciting and magical moments too, and I also got to meet some pretty amazing people! So in this post, I'd be talking about one of the highlights of my time at Oxford so far which has definitely been the Oxford Union! The Oxford Union is the world's most prestigious debating society. It is also the largest society at the University of Oxford. It has an unparalleled reputation for bringing international guests and speakers to Oxford. The Union has hosted world leaders, including US Presidents Reagan, Nixon and Carter, Albert Einstein, Mother Teresa, the Dalai Lama, Malcolm X, Diego Maradona, Sir Elton John, Micheal Jackson, Shia LaBeouf, Emma Watson, Desmond Tutu and Morgan Freeman, to name a few. It has been established for 189 years, with the aim of promoting debate and discussion not just at Oxford but across the globe. While I was waiting in line for one of the Union Events, one of the students waiting in line as well said to me "I think the Union is the best part about Oxford" and I totally agree! She was a visiting student from Columbia University. As a member of the Union, you get to meet people that you would either never get to meet in real life or you will have to pay so much to see, so it's definitely an amazing experience. As a member of the Union, you get to attend events with world renowned speakers, and in some cases, you might be lucky enough to meet them personally! You also have the debates which are held weekly and draw experts from all over the world to speak on very important issues. There's also the Union Bar which you get access to as a member and the Oxford Union Library. I hear you are also allowed to bring in one or two guests from outside which is really cool. This year had a very interesting line-up with so many amazing speakers. I tried to go for as many as my course would let me lol They have speakers virtually every day, so you can't go for every single one, but I was very happy with the ones I attended. I pretty much saw all the speakers I wanted to see this year, the only exception was Gordon Brown- the former UK prime minister. His talk was right after one of my classes, so I couldn't make it! What I love about the Union is the variety of speakers that they have. You could have a former President speaking today and then the following day, an artist speaking. There's no limit or restriction as to who is invited, as long as the speaker is influential, it doesn't matter whether the speaker is from politics or entertainment. However, I'd say overall political speakers tend to make up a big part of the speakers line-up. In this post I will be sharing my most memorable speakers this year. They included everyone from Kevin Rudd- the former prime minister of Australia to Eric Holder- the former Attorney General of the United States under the Obama Administration, Terrence Howard, Adwoa Aboah, Emeli Sande, Actress- Anna Faris, Marc Jacobs and Edward Enninful to name a few. This was definitely one of the highlights for me this year. Kevin Rudd was the former prime minister of Australia from 2007 to 2010 and again in 2013. He came to speak at the Oxford Union this term. I had the opportunity of not only meeting and speaking with him but also getting my book signed. He just released his book 'Not for the Faint Hearted' which I got that day. This is a picture of when I got to meet him. I'd say meeting Kevin Rudd was definitely the highlight of the Union for me. Funny story, during the conversation, he asked me where home was for me, and I said Nigeria. He said: 'Lagos or Abuja?' I said 'Lagos' and then he said 'how are you handling the Lagos traffic' lool! We both ended up laughing about that lol. 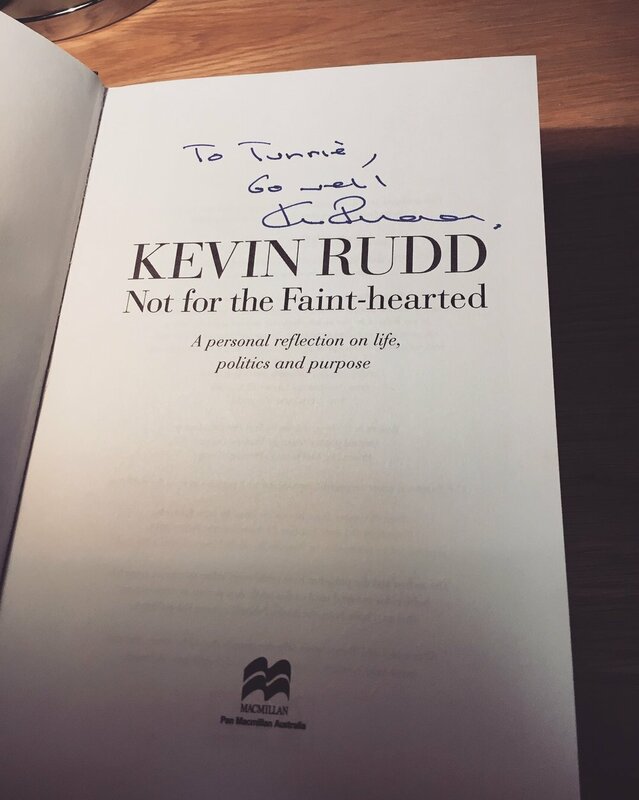 You could see some more photos with Kevin Rudd on my Instagram here. As a lawyer, this was definitely a highlight for me. Eric Holder was the former Attorney General of the United States under the Obama Administration, He was also the first Black man to become the Attorney General of the United States. I didn't just get the opportunity to hear him speak. I had the opportunity of attending a private meet and greet with him and about twelve students, so that was very exciting. I remember when he walked into the room with about twelve of us and in my mind I was like "omg this is the former Attorney General of the United States!" But it was definitely a highlight for me. We had the opportuniny of asking him questions. He answered everything from 'what makes a good lawyer' to questions about his time in office. I also had the chance of getting a picture with him! In all the speakers this year, I'd say Terrence was the most entertaining for me. He was so funny! He also took pictures with almost everyone. After his talk, he came round to the Union Bar to hang out with the students, and to talk with us. You could check my Instagram here and you'll see some videos of him hanging out with students at the union bar. I can't upload videos here for some reason. Did I mention that I love Empire? 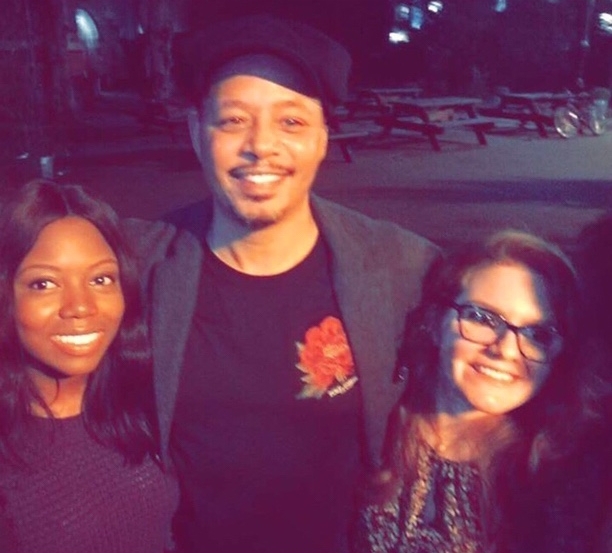 I watched it up until Season 2 and I haven't had time to follow up, but after meeting Lucious Lyon, I'd definitely go back to it when I have the time! Terrence Howard during his speech. This was my second Union Visit! This one was very exciting for me because I thought she was just going to speak, but she ended up performing! which was amazing! 'Beneath your Beautiful' used to be my most played song at some point, and I love 'Clown' by her also! She didn't perform 'See beneath your beautiful' but she performed 'Clown' which was lovely to hear. She also sounds amazing live! You could see videos of her performance on my Instagram here. You could also swipe right for more videos, my favourite was her rendition of 'Clown'. Adwoa Aboah has burst onto the fashion scene this year! She is a model and activist. This year she became the face of Marc Jacobs Beauty, the new face of British Vogue and she also won the Model of the Year award at the 2017 Fashion Awards, so I am so proud and happy for her. I didn't actually meet Adwoa at the Oxford Union, she came for an Oxford ACS Event for Black History Month, and that's where I had the opportunity of meeting her. She was on a panel, with some other amazing women which I would be talking about in a bit. She was also very sweet! Anna Faris! I loved all the scary movies, so it was lovely hearing Anna Faris speak! She was also the funniest speaker in my opinion. She was also very down to earth, even Chris who was interviewing her had to mention that at some point. She also said that she felt very nervous because she didn't think she was smart enough to speak at Oxford lol which I thought was really funny. She gave us four things that she lives by and I think they were pretty amazing. They were: i) Ignore bitter people ii) Do something brave everyday iii) Follow your passion and iv) Be romantic in all things. She couldn't have said it better! Thank you Anna! You could watch the video of Anna Faris speaking at the Union on my Instagram here and you could swipe right for more videos. 7. Marc Jacobs and Edward Enninful. This was my very first Union Event and it was a very good introduction into all things Oxford Union. Marc Jacobs is of course an amazing and world renowned Fashion Designer. Edward Enninful is the first Black Editor in Chief of British Vogue. 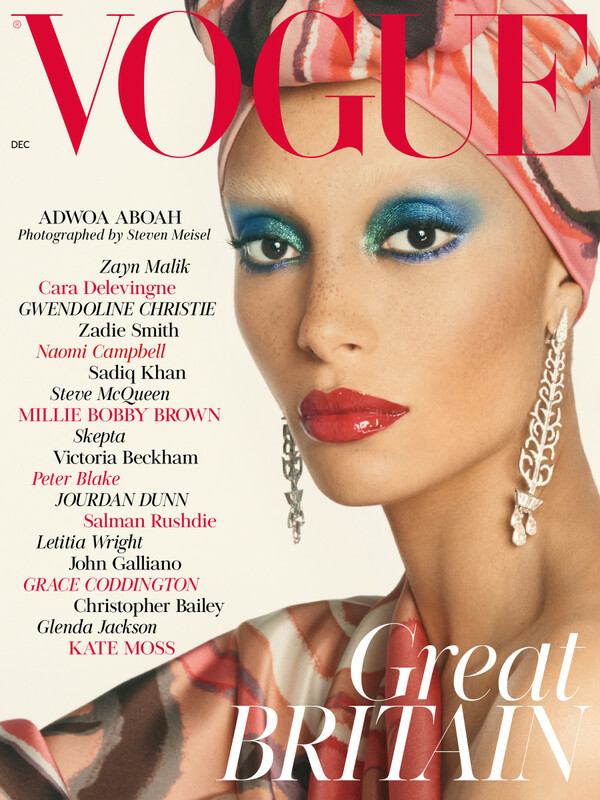 For his very first British Vogue cover since becoming Editor, he featured Model, Adwoa Aboah who I talked about earlier. At the event, Marc and Edward talked about their respective fashion careers and they also answered questions from the audience. During the Q and A session, they both talked about fear. For Marc Jacobs, he mentioned how he's always struggled with the fear of failure i.e. his collections not being that good, but he went on to say how that fear has always been what has driven him to keep on breaking all these milestones in fashion. That's definitely a major key right there! Monica Lewinsky! This is the only Oxford Union talk that you will not find on youtube. The Oxford Union has a youtube page where they upload videos of their speakers and events that are watched by thousands of people all around the world every week. However, Monica Lewisky did insist that her speech and interview were not recorded. We weren't even allowed to take pictures but I managed to sneak in a few lol What surprised me was how extensively she spoke about the scandal. She had a very long speech at the start discussing the scandal and everything that happened during and after that time. Today she is an advocate against cyber bullying and she partners with charities in raising awareness, while drawing from her own experiences with cyber bullying. This was one of the fullest events that I attended this term. I arrived there early and the line was so long, it actually stretched out onto the streets. Someone on the line told me that the only other time he had seen a line this long this term, was when Stephen Hawking came to speak at the Maths Department, and probably when Gordon Brown came to the Union. It was a very full event! I love poetry! I used to write poems a lot when I was younger, but for some reason they have become less frequent over the years. I need to go back to my poetry days. But what I do a lot of, these days, is to attend spoken words nights- I love them! and I had the chance to attend a lot of them during my year off. Anthony Anaxagorou is an award-winning poet and writer. He was also the first young poet to win the London Mayor's Poetry Slam. 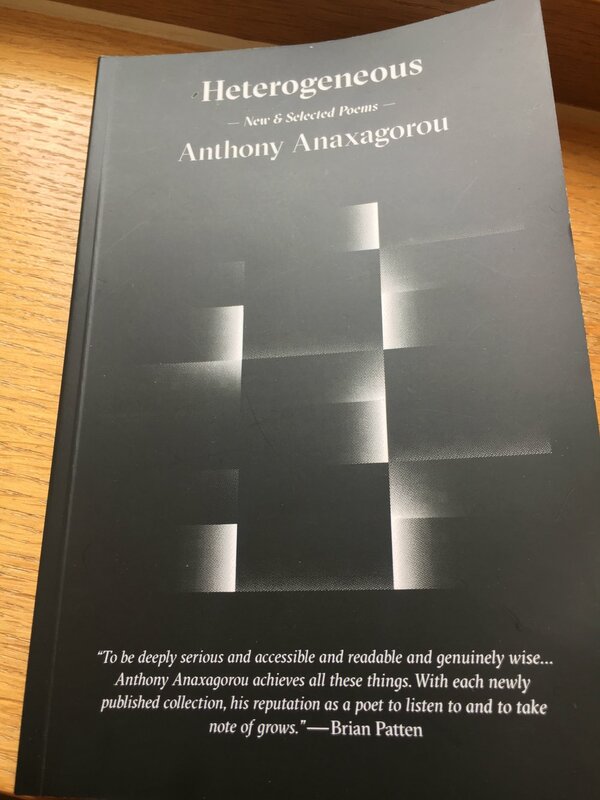 I had seen Anthony Anaxagorou at a spoken word night during my year off in London, but it was great to hear him perform again in Oxford. He didn't come to the Union however, he came for the Oxford ACS Black History Month Event along with Adwoa Aboah and some other amazing people that I'll talk about in a bit. He performed his poem "If I Told you" from his book "Heterogenous" and I'll really advise that you read it if you're interested in poetry. It was really good. It was about 'African History' and reclaiming the narrative. I also had the opportunity of meeting him and getting my book signed. He just released his book 'Heterogenous' a new collection of poems. 10. Clara Amfo, Robin Walker and The Slumflower. I mentioned earlier that there was an Oxford ACS Event for Black History Month this term, I would say that it was Ahhmaazing! The performances, the speakers, the dancers, everything. There was a panel with Adwoa Aboah, Clara Amfo and The Slumflower (Chidera). There was also a poetry performance by Anthony Anaxagorou and a presentation by Robin Walker, author of "when we ruled". It was an all round amazing night. From the left- you have The Slumflower (Chidera), Adwoa Aboah and Clara Amfo. Clara Amfo is best known for her BBC Radio show. She was awarded Radio Personality of the Year at the Glamour Awards 2016 for her work at Radio 1. The Slumflower (Chidera) is an award-winning style blogger, presenter and speaker. She is also an activist for body-image and body positivity. 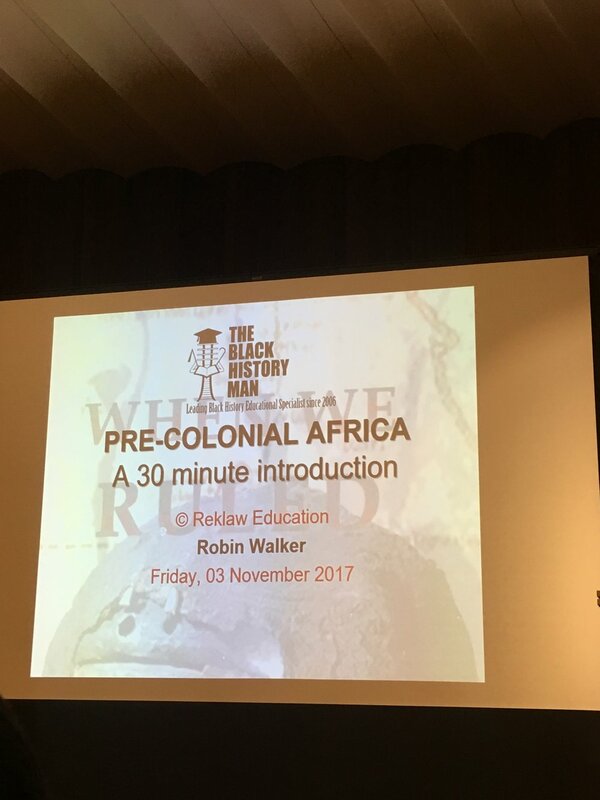 One of the highlights of the event for me was definitely the presentation by author, Robin Walker on Africa's pre-colonial history. In his presentation, he drew a lot from his book, "when we ruled" It is really sad that some people don't know about their history as Africans and the lineage of great and phenomenal men and women that they come from- and how great and pioneering Africans were even before slavery and colonisation. I would really advise that you get his book "when we ruled" which documents Africa's pre-colonial history. I also had the opportunity of meeting him afterwards and getting my book signed by him which was really cool. Beyond influential speakers and famous faces, the Union first and foremost is a Debating Society and they have Debates every week. In every debate the audience is given a chance to get involved and voice out their opinions too. The exciting thing about these debates is that they are not debated solely by students. So there are four speakers on each side. There is usually only one student speaker on each side, while the other three speakers are experts in that particular field being discussed. So often times you'd have the opportunity to watch members of parliament or leaders in their fields, battle each other in these debates which is really cool. This term I attended The European Union Debate which was of great interest to me because of Brexit and just generally being a law student and having to deal with EU law for so many years lool. It was the Union's final debate of the term and it was so good! I'm not even going to bother explaining how good it was. I can't do it justice. So I'll just put up a link to the video here once it becomes available on youtube and you can watch it if you're interested. Some of the debaters included; Bim Afolami MP - British Conservative Party politician; Theo Paphitis -the owner of Ryman, Robert Dyas and Boux Avenue; Anna Soubry MP- Conservative MP for Broxtowe and former Minister of State; Paddy Ashdown - The former Leader of the Liberal Democrats ; Sir Julian King -The European Commissioner for the Security Union who also served as Ambassador to Ireland and France. 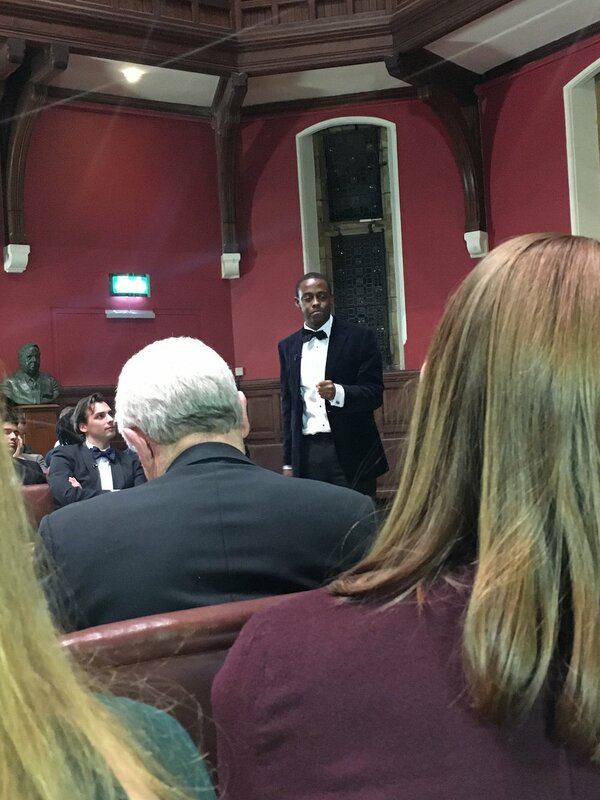 A picture of Bim Afolami MP speaking at the Oxford Union Debate. Bim Afolami was also treasurer of the Oxford Union when he attended Oxford. I found it so interesting seeing people so influential debating these very important issues. It was really exciting to watch! Definitely had chills during some of the speeches. These are some more pictures of the Union. We were taken on a tour of the Union by the Vice President of the Union in my first week. I was able to take photos then and I have also been able take more photos since becoming a member. This is the Union Library. A clearer picture of the Union Library. I think the Design of the Union Library is stunning, especially the ceilings. 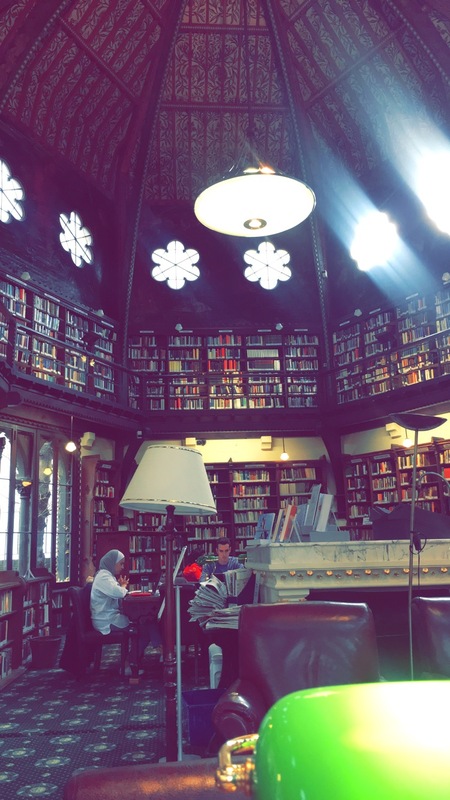 With so many essays and readings, I think the set up of the Oxford Union is perfect, so you could get your work done in the Oxford Union library and then when it's time, go down to see your favourite speaker. I tend to work in the Union Library a lot. This is the Oxford Union Bar. When Terrence Howard came, this is where he sat down after his speech to hang out with the students. In the Bar, they also have photographs of all the speakers that have come to hang out in the Bar afterwards. I couldn't help but notice the one of Shia Labeouf when he came to the Union (not sure if you can spot him on the wall) Apparently, it was quite a memorable visit. The best part of the Union Bar has to be the kinds of people you meet there. So when you get a membership of the union, you can either get a one year membership or become a life member. As a life member you can come to the union in many years time to hear your favourite speaker, or you could come back to hang out at the bar or even use the union library. The Union Bar tends to be the most popular option for former alumni, so at the bar you'll meet people who studied at Oxford in nineteen eighty something telling you about what the Union was like when they were students, so it's always really cool. A bit of History- Benazir Bhutto, former prime minister of Pakistan was President of the Oxford Union when she studied at Oxford. Boris Johnson was a also a former President of the Oxford Union. Along the passage wall of the Union, you have photographs of all the influential people that have visited the union over the years. These are some of the pictures from the Union passage wall. You might be able to recognise some of them. This is Mother Theresa at the Oxford Union during her 1993 Visit. This is The Dalai Lama at the Oxford Union in 1991. This was taken during the Queen's Visit to the Oxford Union in 1968. This picture was taken during Desmond Tutu's Visit to the Oxford Union. This is Albert Einstein at the Oxford Union in 1933. I think I stared at this particular photograph the longest. This is the Gladstone Room named after William Ewart Gladstone who was the former Prime Minister of the United Kingdom and also the former President of the Oxford Union. On the ceiling of the Gladstone Room, you have the crests of all the different Oxford Colleges- most of them. This here is the Gladstone table. Apparently it was a gift from William Gladstone to the Oxford Union. It was his Cabinet Table when he was Prime Minister and legend has it that the table was shaped like that, so he could see all the faces of all the members of his cabinet, and know if someone was being dishonest lol. The private meet and greet with Eric Holder( former Attorney General of the United States), which I attended was held here in the Gladstone room. These are more pictures of the Union! p.s If you sent me a message and I haven't gotten back to you, please bear with me, it's been a very busy term, but I should get back to you in the next couple of days.